RSA COSC 201 ST. MARY’S COLLEGE OF MARYLAND FALL 2012 RSA. 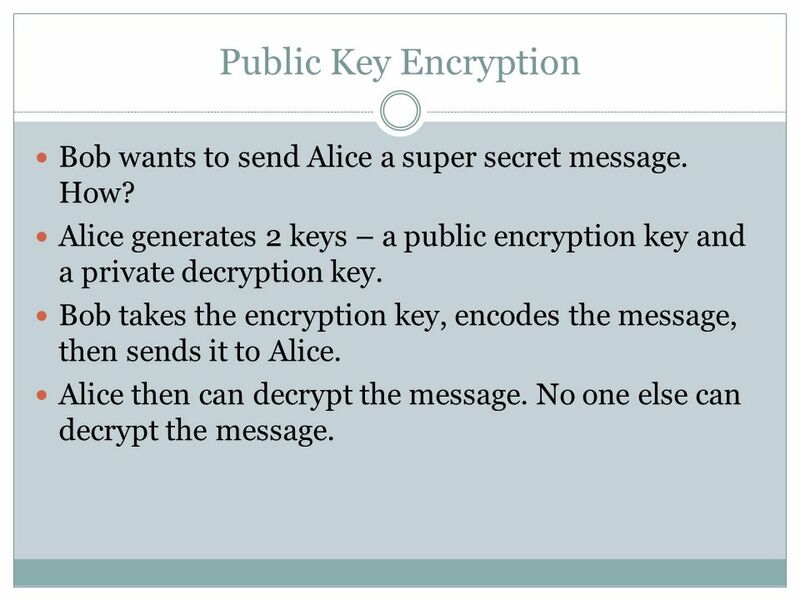 2 Public Key Encryption Bob wants to send Alice a super secret message. How? Alice generates 2 keys – a public encryption key and a private decryption key. Bob takes the encryption key, encodes the message, then sends it to Alice. Alice then can decrypt the message. No one else can decrypt the message. 9 Finally, Primality Testing Solution? Randomized Algorithm: Pick a random integer i from 2 to n-1 Compute gcd(i, n). If this is not 1, primality fails. Otherwise, repeat up to k times. 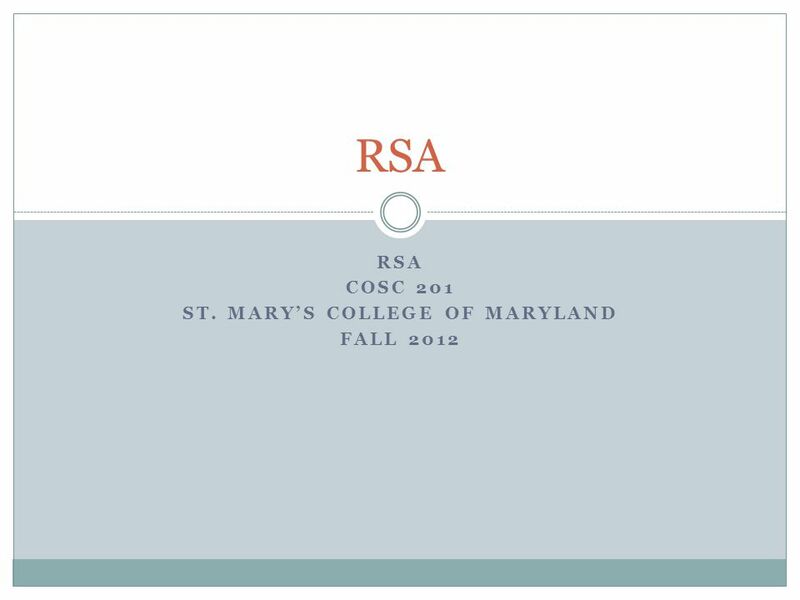 Download ppt "RSA COSC 201 ST. MARY’S COLLEGE OF MARYLAND FALL 2012 RSA." RSA and Public Key Cryptography Oct Nathanael Paul. 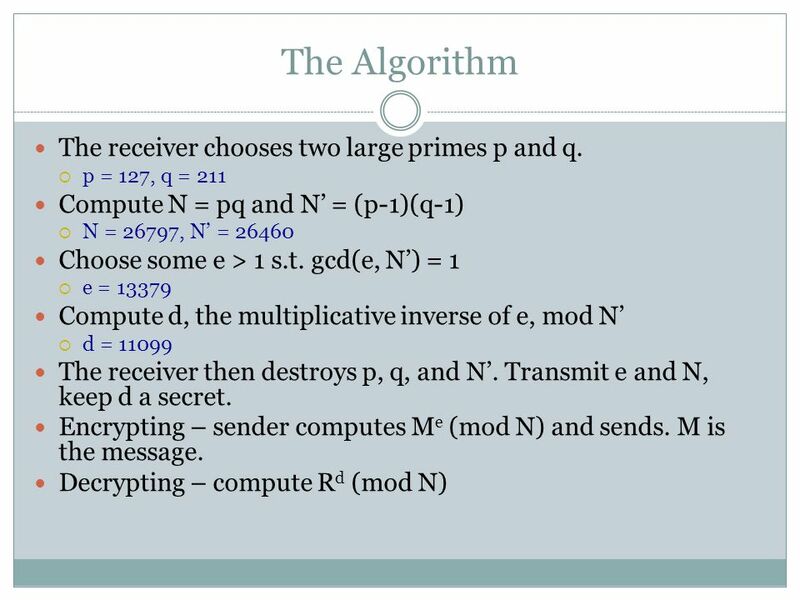 Data Security 1 El_Gamal Cryptography. Data Security2 Introduction El_Gamal is a public-key cryptosystem technique El_Gamal is a public-key cryptosystem. 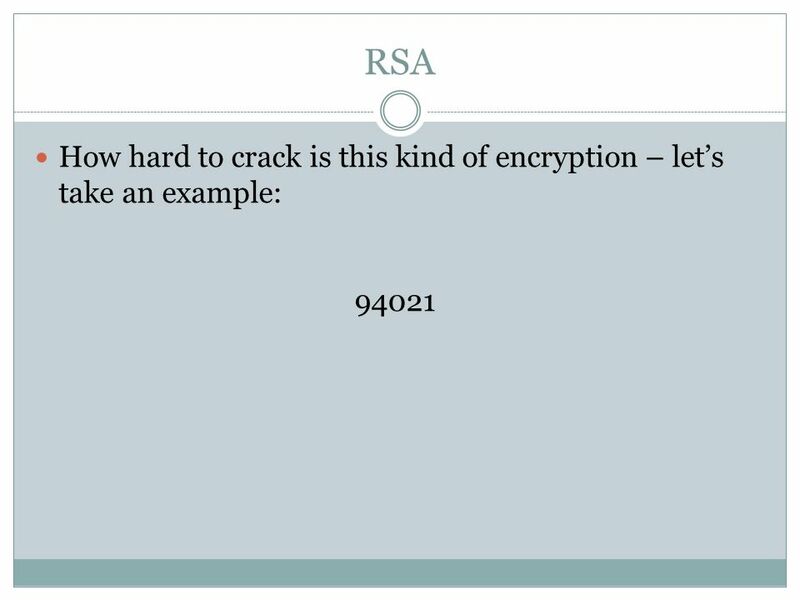 Public Key Cryptosystems - RSA Receiver Sender Eavesdroppe r p q p q p q p and q prime. BY : Darshana Chaturvedi. 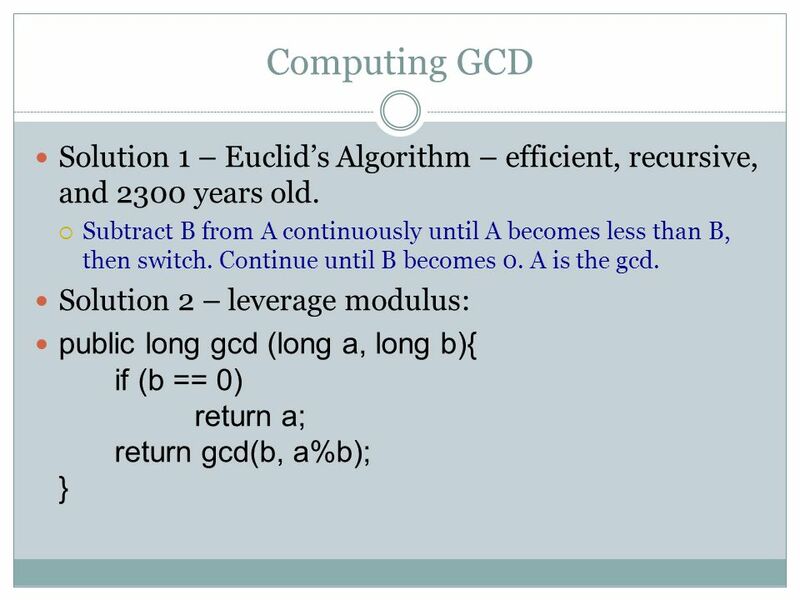  INTRODUCTION  RSA ALGORITHM  EXAMPLES  RSA IS EFFECTIVE  FERMAT’S LITTLE THEOREM  EUCLID’S ALGORITHM  REFERENCES. 22C:19 Discrete Math Integers and Modular Arithmetic Fall 2010 Sukumar Ghosh. Authentication and Digital Signatures CSCI 5857: Encoding and Encryption. 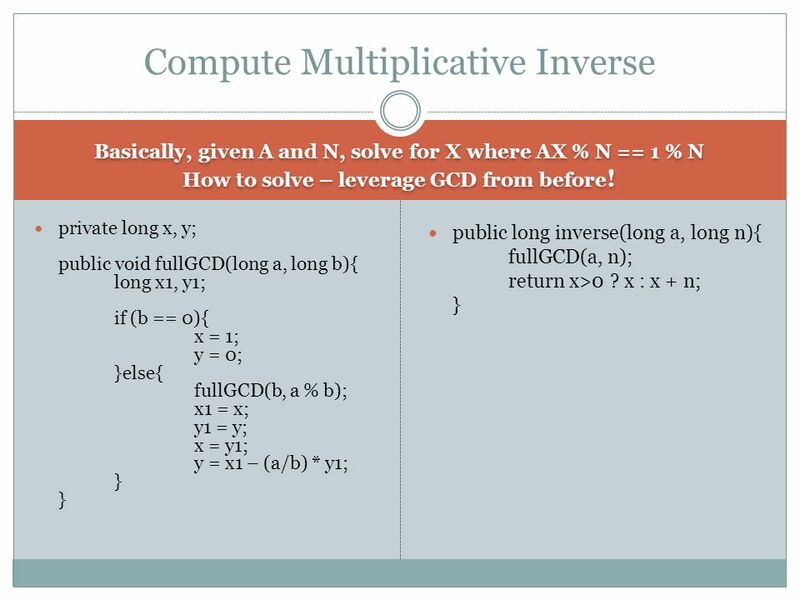 Great Theoretical Ideas in Computer Science. UMass Lowell Computer Science Analysis of Algorithms Prof. Karen Daniels Fall, 2002 Tuesday, 26 November Number-Theoretic Algorithms Chapter 31. Foundations of Network and Computer Security J J ohn Black Lecture #13 Sep 26 th 2007 CSCI 6268/TLEN 5831, Fall 2007. Foundations of Network and Computer Security J J ohn Black Lecture #10 Sep 29 th 2005 CSCI 6268/TLEN 5831, Fall 2005. 1 Lecture #10 Public Key Algorithms HAIT Summer 2005 Shimrit Tzur-David. 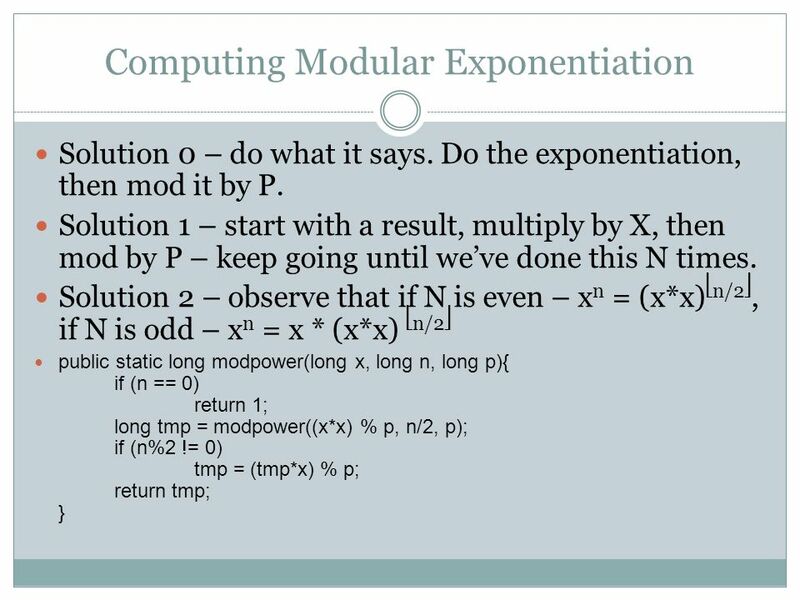 CSE 321 Discrete Structures Winter 2008 Lecture 8 Number Theory: Modular Arithmetic. 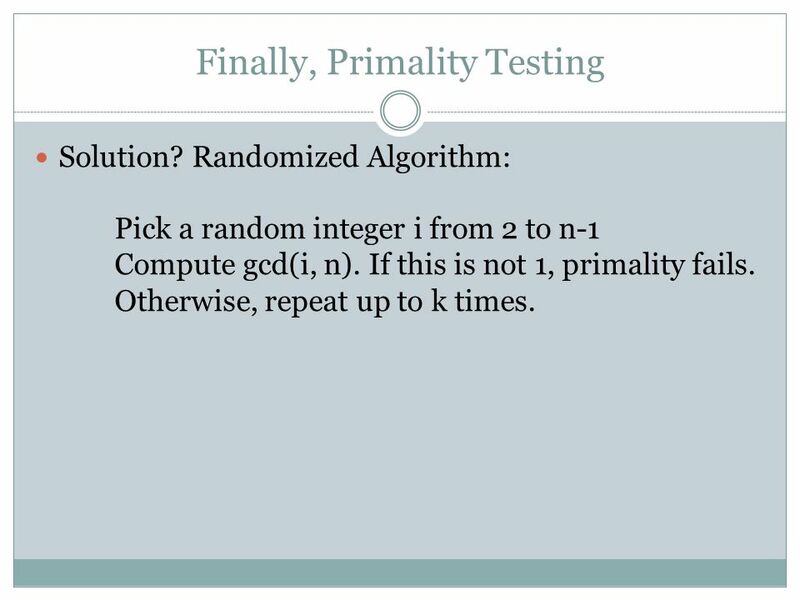 Theory I Algorithm Design and Analysis (9 – Randomized algorithms) Prof. Dr. Th. Ottmann. 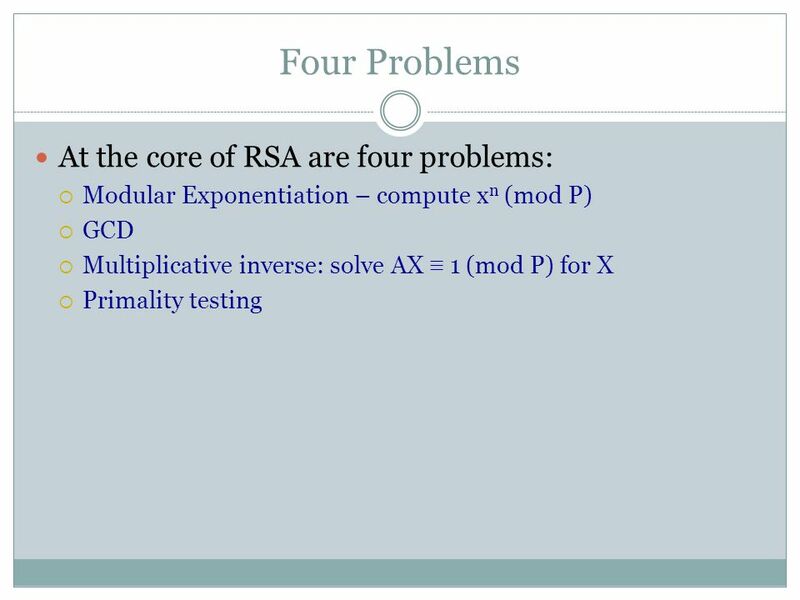 CPE5021 Advanced Network Security --- Advanced Cryptography: RSA and its implementation --- Lecture 1.1 Last lecture we saw the data encryption standard.